Tebow, aka GS Tebow is a 7 1/2 year old black male born December 29, 2010. His sire is Daddy Warbarks, and his dam is GS Fantasia. Tebow has no races to his credit on Greyhound-Data.com. He was originally adopted from a group in Jacksonville, FL. Tebow was in a home for four years, but was surrendered to GALT due to a change in family circumstances. Tebow has been diagnosed with Pannus and one drop is put in each eye daily. This will be required for the rest of his life. It is not known at this time if Tebow is small animal of cat tolerant. 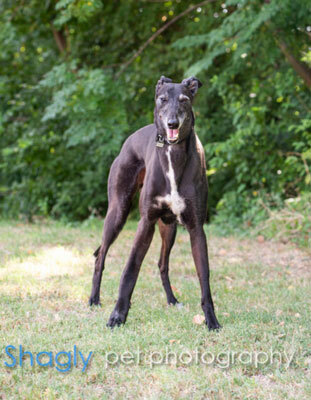 Tebow is a handsome, 7 1/2 year old tuxedo hound with a sleek, shiny black coat. This well-behaved boy has the best house manners and he walks like a dream on lead. “Te" has plenty of energy to spare and he has a long life ahead of him. 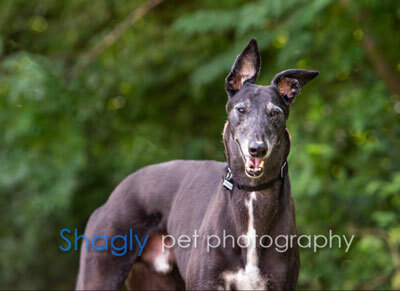 He's a happy greyhound who loves to run and enjoys tossing his toys in the air and then pouncing on them. He engages his people in playtime by play bowing to them with a twinkle in his eyes. There’s a genuine sweetness about Tebow, who gives his affection generously and soaks it up when it’s bestowed upon him. Tebow will do best in a loving home with no toddlers. 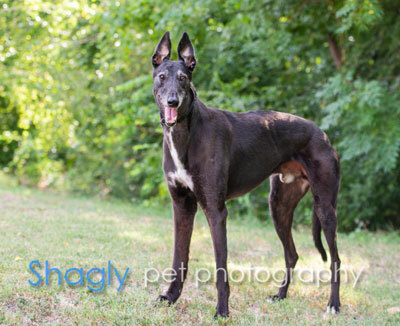 While he gets along well with other dogs, he’s a very confident boy will also do fine as an only dog. It’s not yet known if Tebow is okay with cats or small animals.